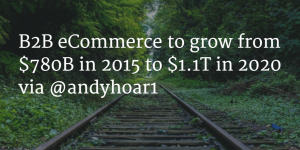 Andy Hoar, Forrester B2B E-Commerce analyst released a new report that states that U.S. B2B E-Commerce will top $1.1T, up from $780B in 2015 (does not include EDI). 74% of B2B buyers research at least one-half of their work purchases online. 30% of today’s B2B buyers complete at least half of their work purchases online. With that percentage nearly doubling to 56% by 2017. 60% of B2B companies report that their B2B buyers spend more overall when those customers interact with multiple channels. Read the report and Andy’s blog. It is an excellent read.